Deficiency of spleen qi and yang with symptoms of poor digestion, acute and chronic gastroenteritis, diarrhea or loose stools, fatigue and cold cramping in the epigastrum or abdomen. Acute cases exhibit vomiting, explosive diarrhea and abdominal pain. 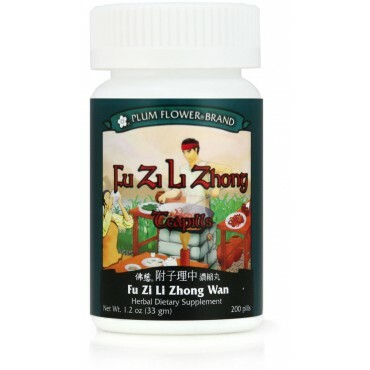 Besides chronic digestive dysfunction, this formula can be used in certain cases of duodenal ulcer, ulcerative colitis and prolapse of the intestines or stomach are some of the imbalances satisfied clients have used this product for. Codonopsis pilosula root, Atractylodes macrocephala rhizome, Zingiber officinale rhizome-dried, Glycyrrhiza uralensis root, Aconitum carmichaeli root-prep, Botanical wax, Talcum. - Dang shen, Bai zhu, Gan jiang, Gan cao, Fu zi, Botanical wax, Talcum. Contraindicated during the early stages of acute infection or illness, such as cold or flu. Contraindicated during pregnancy.